Last night I had the great pleasure of attending a talk by Joan Marler, "The Body of Woman As Sacred Metaphor." Joan is the founder of the Institute for Archaeomythology, and was the special guest of the Sonoma County Pagan Network. Her talk was a delicious feast of images & information about goddess statues, mainly from about 37,000 BCE to 3000 BCE, from central Turkey to southeastern Europe. She described voluptuous female imagery invoking & expressing the source of animal & plant abundance & domestication. Her account was simply the most satisfying version of this rich history I've encountered. I awoke this morning with a new sense of moving within a continuous, unbroken, ancient flow. Two smaller themes were particularly poignant for me: statues of women & children with bird heads, & owl statues & vessels. These so vividly convey how communion between human & bird was once taken for granted, I feel affirmed in the communion I experience with birds today. 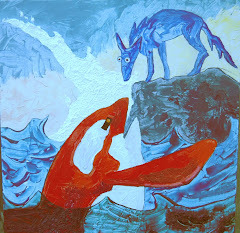 With excitement, I recognize the animal spirits I paint as legitimate actors in the long, ongoing drama of human life playing in company with all sorts of fellow beings. I savor in a new way the work of creating these images. 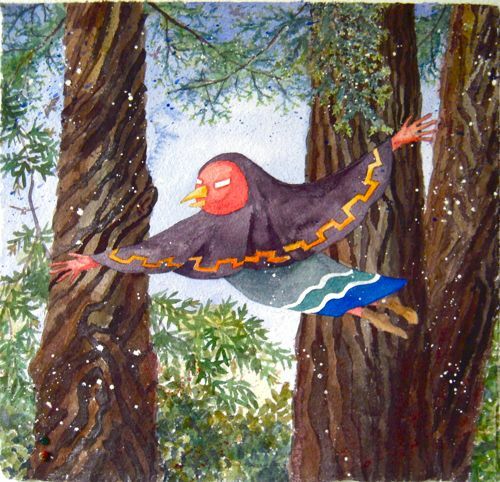 This one is Bird Grandmother in the Redwood Grove, which flew out of me after a visit to Armstrong Woods. She is a watercolor, about 11" square. After Joan's talk, I feel how she expresses the happiness of being briefly among great beings who endure thousands of years. She is a messenger of our joy among trees.